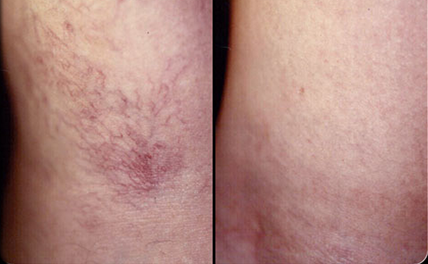 Laser Light assisted Superficial Spider veins treatment for men and women in Westbury, Newyork. Both men and women are making unsightly facial and leg veins a thing of the past. Laser 'n' Beyond Laser can safely and effectively treat both tiny superficial face and leg veins on men and women of all skin tones. 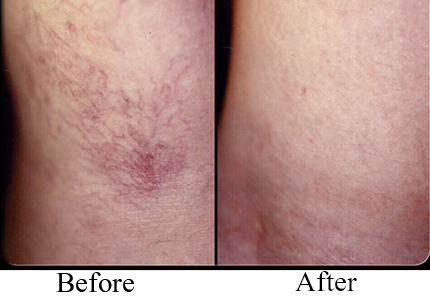 Laser treatments are being used as an alternative to or to complement sclerotherapy for small veins or spider veins. It works on the same basic principle: a light beam is pulsed onto the veins in order to seal them off, causing them to dissolve. Successful light-based treatment requires adequate heating of the veins. Several treatments are usually needed for optimal results.